Joseph Hilaire Pierre René Belloc, 1870-1953, was born in France of a French Catholic father and an English protestant mother. His mother later converted under the influence of Cardinal Manning, a good friend and mentor of Hilaire. Belloc is easily one of the most well-known Catholic writers and apologists of the 20th century. This book, published in 1923 after Belloc spent some time in the United States (his wife was American), is a bit reminiscent of Alexis deTocqueville’s work Democracy in America, published in 1835 after his own extensive travels in America. What is surprisingly different in their conclusions about the American political spirit is that Belloc saw more of a monarchical principle at work here than deToqueville did. The Contrast represents Belloc’s mature considerations of the important and critical contrast between England (and by extension, the rest of Western Europe which Belloc considers to be much closer in spirit and temper to England than to America) and that new, and to him foreign, thing that he encountered in his time here. 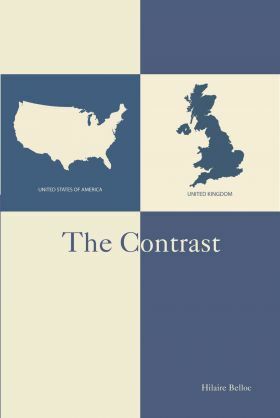 The different topical areas that he discusses and contrasts are the physical (geographical), social, military, religious, literary, and linguistic. This is a fascinating analysis from the pen of a great Catholic man who was also a deeply provocative political thinker.